Clean Sheet Co.’s The States project is off and running, and the response has been fantastic. 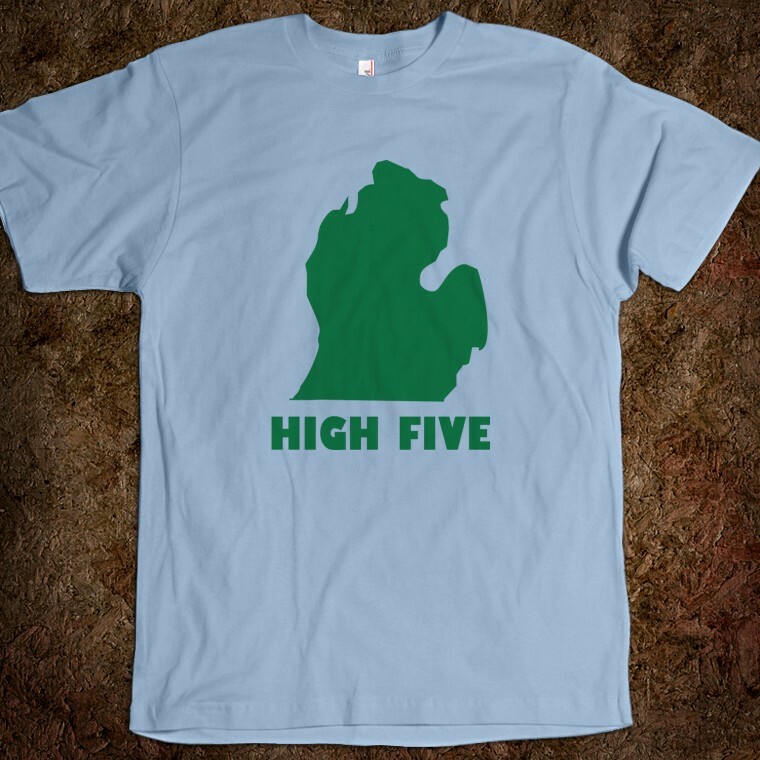 Thanks for ordering shirts, giving feedback, and asking – quite loudly at times – when your state was coming. I promise you: it’s coming! There are a lot of states, and Clean Sheet Co.’s going to get to them all (and then some). Starting today, we check five new states off the list. 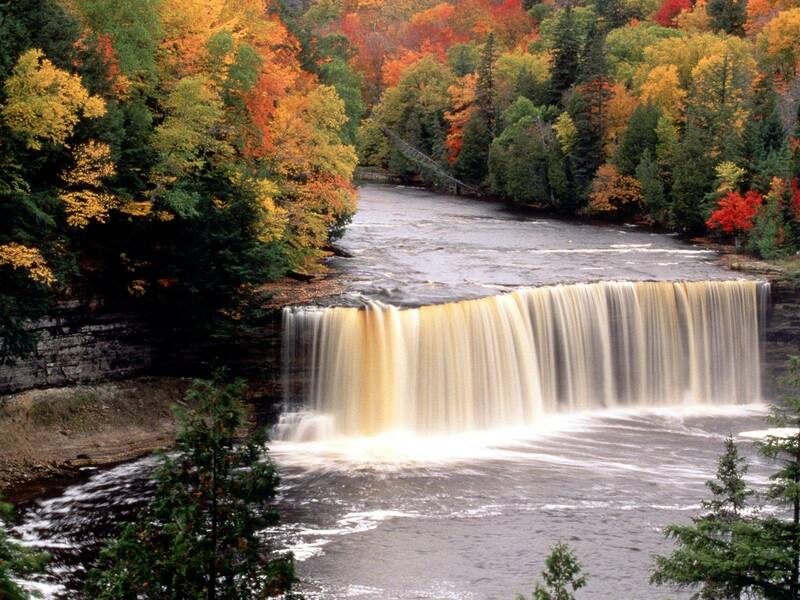 Michigan, South Carolina, Rhode Island, Kansas and Idaho get the Clean Sheet Co. treatment. I’m also pleased to announce a new way in which we’re structuring the debut and ordering of each State shirt. Beginning with Volume 2, each State design will be a Clean Sheet Co. Lab project – which means we’ll be asking folks to support the design(s) they are interested in. We’ve used The Lab for a few previous projects – including our popular Gadsden Black design – and it’s been a fantastic way to make sure we’re producing exactly the right amount of each shirt, and to reward our core supporters with the best pricing. The Lab works on the ‘Kickstarter’ model: when you support a shirt in the Lab, you don’t actually get charged, but you commit to buying the shirt as long as enough other folks support it too. You also lock in a lower price than the shirt will cost at retail. If support for a given design doesn’t reach a low threshold (20 shirts) you’ll never get charged (and we’ll probably take the shirt’s design back to the drawing board). Oh yeah: and for or those first 20 shirts supported across each design? Shipping to anywhere in the U.S. is free, courtesty of Clean Sheet Co. – so if you’re one of those crucial early supporters, you get a really fantastic deal. “If you seek a pleasant peninsula, look about you.” With a state motto like that, I knew I had an fascinating task ahead of me. Michigan – a place I’ve never been – seemed complex and nuanced in comparison to other states, where colors and themes practically announce themselves right away. I knew Michigan was big, has both industrial and pastorial components, and of course has the funky two-part geography wrapping around the Great Lakes. 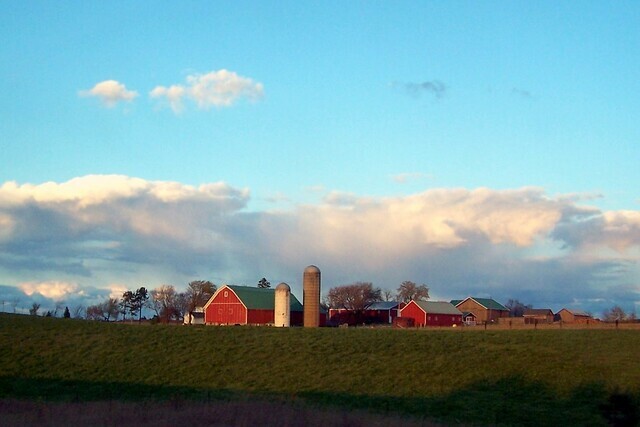 I also suspected that the state had a very down-the-middle American vibe; unlike, say, Texas or Minnesota – places that seem to have cultural brands all their own – Michigan just seemed like the good ol’ U.S. of A. As I dug in, I found some great material, all of it in beautiful balance. I learned about Michigan’s connection to water, and also to it’s sprawling interior. 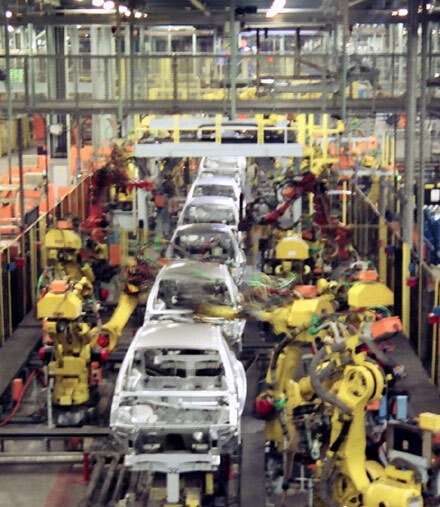 I learned about its history of industry and engineering prowess (Detroit needs no introduction), but also about its natural charms. This balance created a basis for the Clean Sheet design to emerge. In particular, I called on two important state symbols: one natural (the antlers of a decorated white-tailed buck – the state animal, and a sight Michigan outdoorsmen know well) and one engineered (the sprawling, symbolic Mackinac Bridge, which connects Michigan’s two land masses). The antler design created wonderful curved spaces, perfect to house very modest, minimal nod to the bridge and its distinctive paired cables. For the shirt’s colors, I went with a dominant indigo blue and white scheme, with a bit of sunset orange-red. 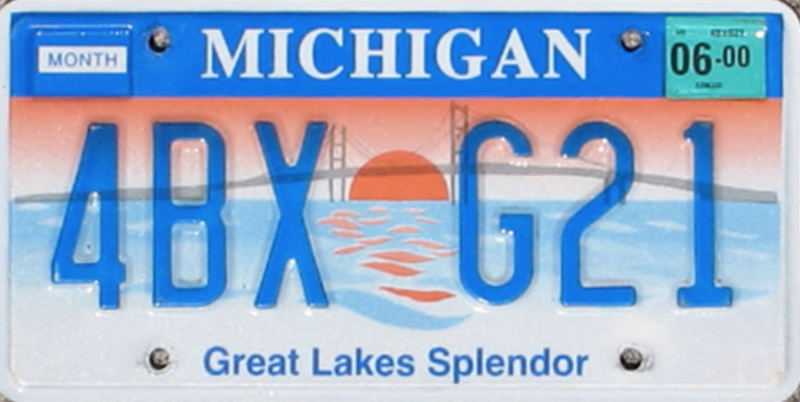 This takes the state’s primary color motif (blue and white), adds splash of bright color (mirroring the look found on certain popular state license plates). I thought the combination ended up capturing the natural, engineered, and even human sides of complex Michigan in a very simple and honest way. If Michigan seemed to offer a variety of symbolic options, South Carolina was very straightforward. I’ve been a fan of South Carolina’s state flag for years, and I knew I’d use its unique trope – a palmetto and a crescent moon – along with its perfectly stark colors (midnight blue and full-moon white) – in the Clean Sheet design. Everything came together quickly; while reading up on the flag and its history, I learned some wonderful detail. This flag has serious history on its side. Its origins date back to the Moultrie flag – a stylized waxing crescent moon on a blue field, the moon holding the slogan “LIBERTY” – which was first flown during the Revolutionary era. During an early skirmish in the War for Independence on Sullivan’s Island, it was shot down by the British, only to be commandeered and charged back into combat by a South Carolinian soldier – an act credited with inspiring the local troops, winning the battle at hand, and protecting Charleston. (As flag origin stories go, that’s a great one.) The tree was later added to symbolize the state’s abundant palmetto population, and also specifically to reference the island, defended that day from British cannons that could not penetrate defensive sand walls protected by palmettos laid atop them. Even when somebody tried to mess with perfection – adding a white halo around the tree, and colorizing it – it was quickly corrected. (Incredibly quickly – the state reverted to the old flag within 48 hours, and the imposter was ignominiously dubbed the “Two Day” flag). The Clean Sheet Co. interpretation hues closely to the venerable state flag for inspiration. Dark navy ink on a mindnight blue shirt just barely delineates the stylized palmetto tree and the Clean Sheet crest, through which the blazing moon passes. And a final touch: the tree is bent in wind in deference to the costal storms that often batter the South Carolina coast, but never break its spirit. As far as visual language goes, Rhode Island shares some unique qualities with South Carolina. First, the singular power of its chosen symbol: whereas South Carolina has the iconic palmetto/moon scene, Rhode Island relies on the mighty anchor. There’s also the matter of simple sloganeering – South Carolina’s historic use of “LIBERTY” is matched by Rhode Island’s “HOPE”, which still graces its flag. As with South Carolina, I’ve always been drawn to Rhode Island’s direct graphic language, and I knew Clean Sheet’s design would inevitably be based around an anchor motif. There are some differences, of course, between the states; one that struck me was just how interestingly Rhode Island’s two components – symbol and slogan – played together. South Carolina placed it’s LIBERTY mark against the moon, where one might expect to gaze and congure dreams about a flight to freedom. The phrase and the visual match. Rhode Island, however, is a bit more wily. It places its HOPE banner beneath an anchor – a stunning, or maybe subversively cunning – bit of symbolism. Hope, the combination seems to be saying, is present even when burderened; or perhaps that the very things that weigh us down also inspire us. Or maybe it’s just a sly, ironic jab from a state that’s always punching above it’s weight class. Whatever it is, it works. The juxtaposition creates visual emotion. I worked with several anchor shapes until I found one I liked – it has has traditional features (like a rounded version of flag’s icon) but has some modern flair as well. The anchor’s ring, stock (crossbar) and shank (neck) are offset against the Clean Sheet crest, creating negative space within the shield shape. As I worked with the components, I was able to realize a wonderful secondary meaning: the negative space within the crest roughly corresponds to a stylized map of the southern Narragansett Bay. It’s a bit wistful, but it’s there: the dark blue is Narragansett water; the lighter blue is land (Conanicut Island, home of Jamestown, on the left; Prudence Island to the top, and the actual Rhode Island – née Aquidneck – on the right). The “ball” within the Clean Sheet Co. shield happens to precisely mark a very important geographic spot: it’s Newport, perhaps the state’s most famous city, and home to momentous acheivements in business, sport and culture. 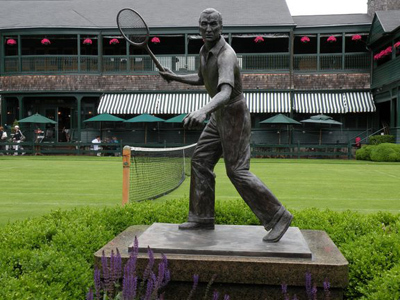 No particular event, in fact, merges those three categories like the America’s Cup yacht races, which were ably defended by American skippers in and around the waters of Newport for more than five decades. In honor of Newport’s nautical patriotism, a disc of antique white and red stripes notes its costal location. The shirt itself is that same antique-white color, in homage to the white base of the state flag. I had a few objectives with Kansas. 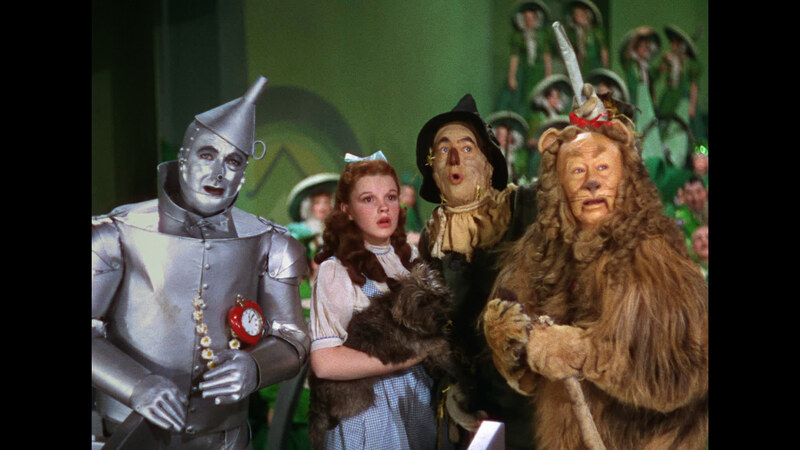 First, not to get into the Wizard of Oz. Nobody needs more of that. 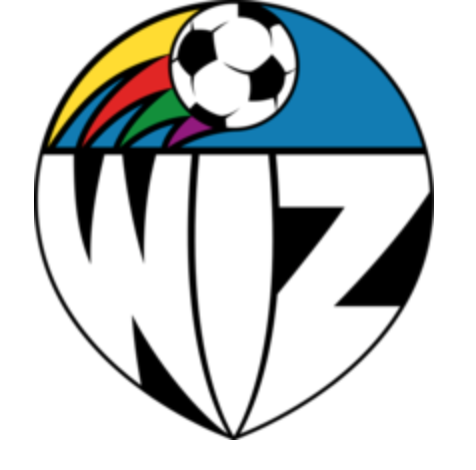 Second, not to conflate Kansas with the Kansas City metro identity. Yes, the larger region does spill over into the state, but a) KC is really Missouri’s deal, and b) Kansas is much bigger than any one city. With those paramaters in place, I started searching for some beautiful visuals that symbolized Kansas. 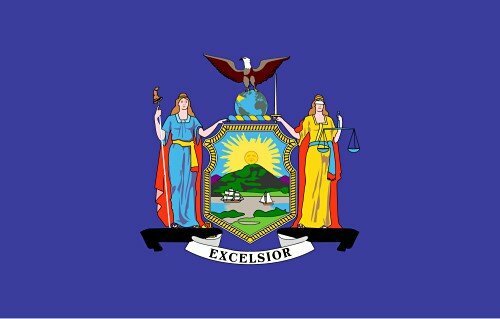 I began, as usual, with the state flag. 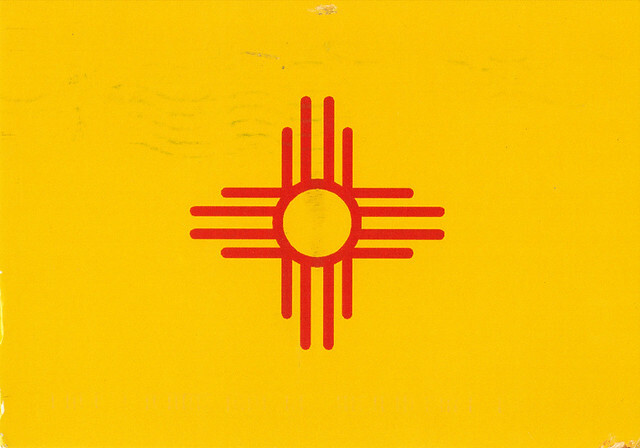 I’ve found there are really two types of U.S. state flags: those with specific symbols and definite ideas (see: South Carolina, Rhode Island, New Mexico, Alaska, etc. ), and those who put a very detailed seal on a solid-color background and call it a flag (see: Michigan, New York, Wisconsin,etc. ).1 These seals are usually heraldic still-lifes, with figures (normally ideals personified, or Native Americans, or Lewis and Clark types, or elk) standing astride an oval that contains a pastoral American landscape. Nice, but visually complicated, kind of boring – in that way museum diaramas are boring – and unoriginal. Kansas is mostly in category 2, with the addition of some interesting details. First, they get points for clarity in slogan choice; where South Carolina uses LIBERTY, and Rhode Island, HOPE, Kansas goes with KANSAS. I mean, absolutely no confusion there. I kid, of course; this quirk actually goes back to an interesting moment in state flag history. For a period, Kansas had a state banner instead of a state flag – it consisted primarily of the word KANSAS and a giant, stylized sunflower. The banner was intended to be hung horizontally, not flown on a vertical staff. And while this brief non-conformity flourished (during the heart of Prohibition – draw your own conclusions), it created problems for the US government (who had to display a few dozen flags and one horizontal banner) but nonetheless was probably pretty cool. 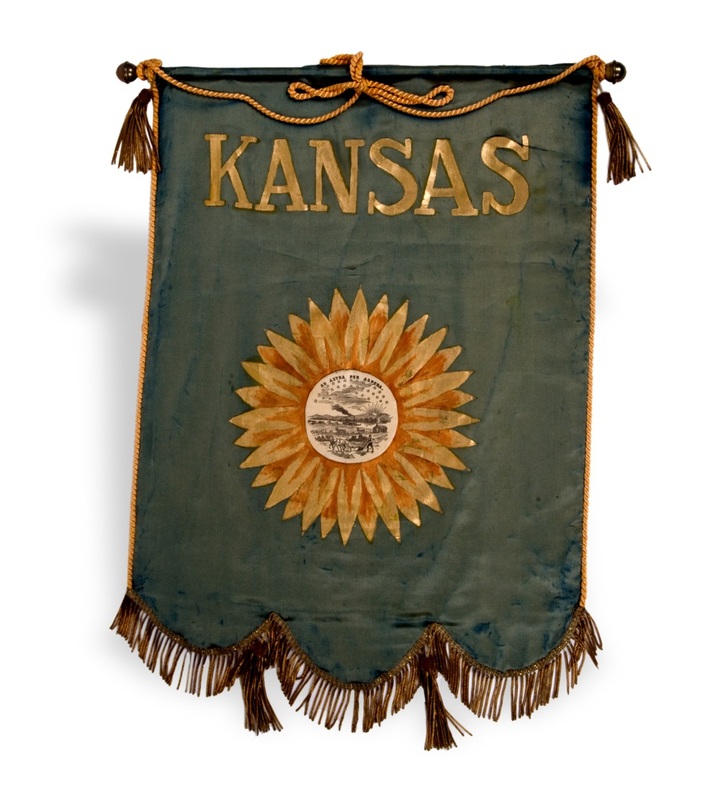 The banner was derived from a speculative sunflower flag comissioned by the state and brought to life by a Topeka-based artist named Albert Reid which I happen to think would have made for one amazing flag, banner, pennant, or any other official Kansas textile. Sadly, the look didn’t stick – not exactly, anyway. Back to modernity, and yes, the second interesting thing about the current Kansas flag: there’s an added component above their seal. 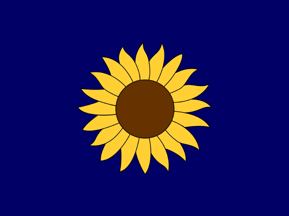 The beautiful, simple, and completely appropriate sunflower has persevered, albeit in a diminished fashion, and is still represented on the Kansas flag. Sunflowers naturally grace the Kansas landscape, are now the official state flower, and yet were and are so abundant in Kansas that at one point the state deemed them a weed and wanted them eradicated. This was quickly corrected; the state government reversed that edict and began to celebrate the flower in due course. And why wouldn’t you – the flower is stunning, bold, colorful, optimistic and broadly popular. Clean Sheet Co.’s Kansas shirt is based on that simple idea: a resplendent sunflower against a blue-violet background. 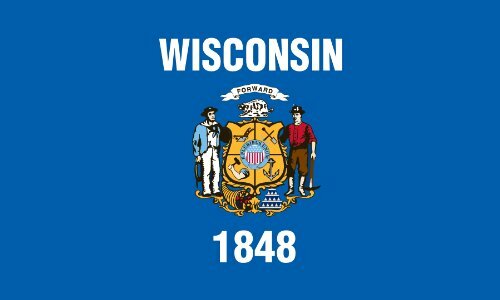 A note on the shirt’s color: in some states – it happens that they’re mostly large, midwester land-grand states, which makes sense – colors can carry a lot of weight. At Cleas Sheet Co., we have no intention to pit rivalrous intra-state collegiate factions against one another with color choice; where possible, we’ll try to stay above the fray. (See: Michigan.) However, when it comes to Kansas, tones of blue are a key state identifier. Instead of going full on Kansas U. royal blue, or K-State purple, we split the difference with a fabric color called “lapis” – a bright, purplish blue – and a crest color that’s a bluish purple. 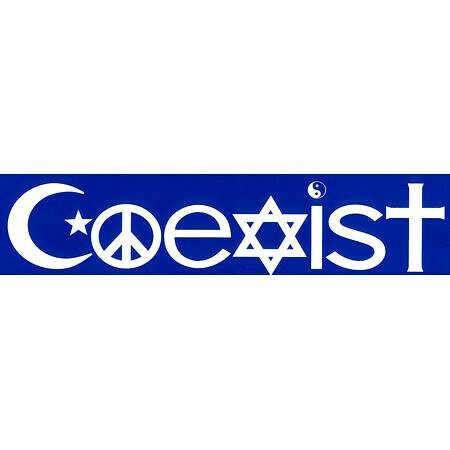 As a wise bumper sticker once said: coexist. And really: it’s all about the sunflower anyway. Like Kansas, I had a few initial rules for Idaho, too. One rule, really: this isn’t about potatoes. Potatoes are honorable, they’re prolific, they’re tasty – yes. 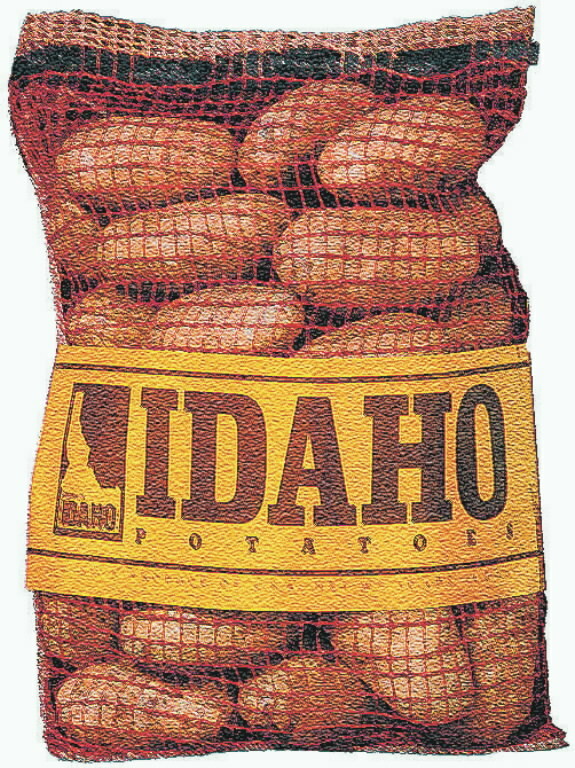 But even though potatoes are a core component of Idaho’s identity, I just coudn’t see basing a shirt design on them. 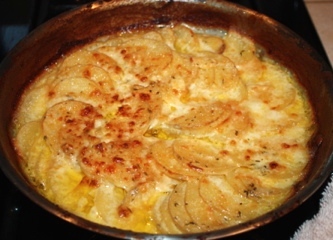 I didn’t know much about Idaho coming in to this endeavor, and didn’t want to end it by knowing a few more ways to make au gratin. 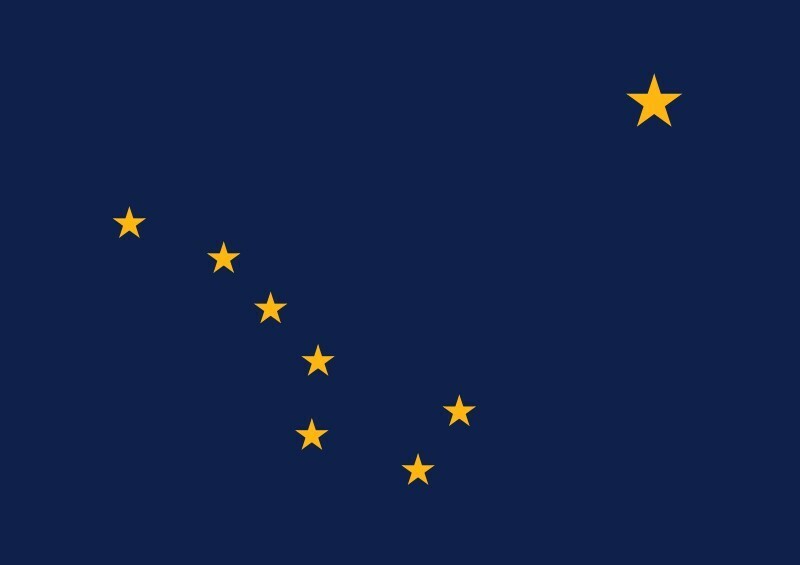 I wanted something different from Idaho. And, as one might guess, Idaho delivered. It turns out, Idaho is a natural paradise. Beautiful, fertile plains; winding rivers, breathtaking mountains. A particularly famous set of those mountains – the Sawtooth range – was so visually intersting, I decided they had to be a part of the Idaho shirt’s deisgn. Their jagged spikes and steep inclines were a perfect visual to start designing with. I was still figuring out how, exactly, to integrate the mountain idea when I stumbled onto something even cooler. They are amazing – almost cosmic. Oh – and they’re found in only two places on earth: India, and Idaho. Perfect. 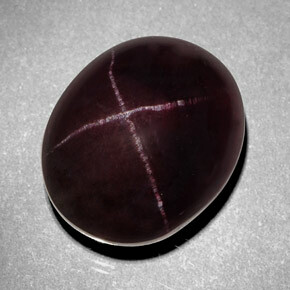 As I learned more about the garnets, I came to notice that most of the “star” effects were four-pointed stars created when two lines of rutile crystals intersected within the stone. Even more impressive were the much rarer six-pointed stars, created by three perfectly-spaced intersecting lines. Some say that Idaho is, in fact, the only place in the world to find the six-pointed variety. In a state known as the Gem State, the star garnet is the official state gem. That settled it. I had the elements (the Sawtooth range, and the star garnet). And I had the colors (deep blue, tones of garnet red, and crystal white). The result is the design you see: the Sawtooth Mountains in slate blue and garnet, stretching across the front of the shirt; the Clean Sheet crest becomes a star garnet, with bright rays stretching out in a six-pointed star from the shield’s center. The asterism effect stretches past the logo and across the shirt to complement the mountain design. The result is a toned, layered design that I hope reflects some of Idaho’s unique beauty. And there you have it: Clean Sheet Co.’s The States, volume 2. I hope it was an interesting read and a worthwhile visual journey. Remember: if you’d like one of these shirts, make sure to support them – early supporters get the best deal, and for the first 20 shirts supported in each design, shipping to anywhere in the US is on Clean Sheet Co. – you can’t beat that. See you back here for Volume 3!